Over the last few years, there has been a resurgence in the quality, care and interest wedding couples are taking when choosing the food and beverages that will be served at their wedding. 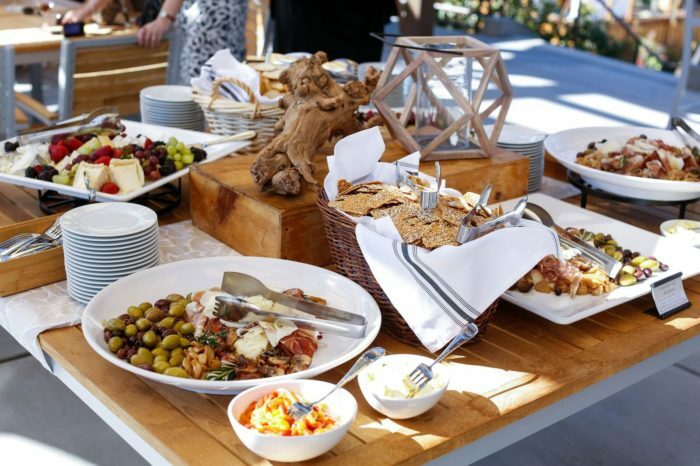 Carefully thinking about and planning the catering aspect of an event while also tying it closely to the guest experience has helped to create some the newest and most innovative trends seen at weddings and events today! Here are some of our favorites when looking at the latest in wedding food and beverage trends. With customization and personalization at the top of the list for many wedding couples, it makes sense that nostalgic menus are so popular right now. Childhood favorites are featured prominently with this trend, while other couples choose cuisine that they’ve enjoyed as a couple. For example, if you and your partner love to eat breakfast together every Sunday morning, consider serving a breakfast menu full of your favorites. We’re seeing couples embrace themes when it comes to the cocktails served at their wedding. Instead of a named drink for the evening, themed bars have become more and more prominent. From whiskey to mimosas to bubbly bars, the options are endless. Create a fun display complete with trendy pitchers and glassware, and it could be a showstopper at the reception. More millennials than ever are going either vegetarian or vegan, and with this trends comes the need for more meatless menus. Think rich and colorful fruit displays that will catch your guest’s attention, and exotic sauces mixed vegetables are sure to be a crowd pleaser. Vegetarian and vegan menus tend to be highly personalized, so get with your caterer to discuss the vegetarian options available for your menu. Eating eco-friendly food is nothing new, but it has burst onto the scene within the last few years with no signs of stopping. Couples want to know exactly where their food is coming from, everything from the vegetables to the meat to the cocktails – it all has a story, and newlyweds want to share it. It’s promising to be an exciting year for weddings, and these wedding food and beverage trends are just the tip of the iceberg. We can’t wait to see what new ideas pop up in the coming year!